Welcome to the Wildwoods Inn Hershey Road located in the Heart of Pennsylvania. Wildwoods Inn Hershey Road dont charge for pets they stay free of charge. For Special Amenities like Wi-Fi Internet and Fiber Optics Cable Television with over 300 channels,Fire place, Wildwoods Inn Hershey Road offers many reasons why it should be your preferred choice while visiting Harrisburg and Hershey. Wildwoods Inn Hershey Road is a 4 bedroom and sunroom with pullout couch , 1 and 1/2 bath single family home which you don't need to share with anyone while you are on vacation. A huge sunroom overlooks our patio which is a perfect corner for cozy reading or to get lost in the chirping of birds. Wildwoods Inn Hershey Road is ideal for either large family or group or just plain romantic vacation you want to spend away from hustle and bustle of big city life where you can just chill out on our huge Patio overlooking our beautiful apple, peach, blue berry trees.Welcome to the Wildwoods Inn Hershey Road located in the Heart of Pennsylvania. Casino, PA Race Track, PA Dutch Country, Amish County, Lancaster Outlets or Gettysburg Battlefields. Casino, PA Race Track, PA Dutch Country, Amish County, Lancaster Outlets or Gettysburg Battlefields.Ski Roundtop. with anyone while you are on vacation. Also our huge sunroom overlooks our patio which is a perfect corner for cosy reading or to get lost in the chirping of birds. Our cozy Fireplace is a star of our Inn and compliments our equally beautiful patio. Don't hesitate to pluck apples, peaches or berries from the Wildwoods Inn proudly maintained yard. Wildwoods Inn Hershey Road was the first official vacation rental to open in Hershey area . 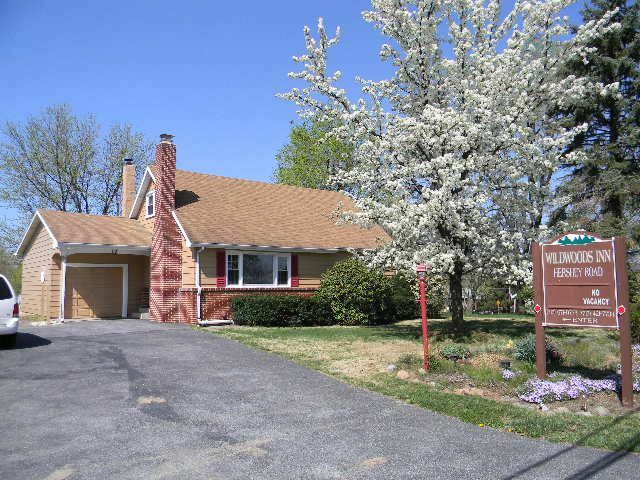 Wildwoods Inn Hershey Road is right on Hershey park Road all Hershey attractions are just 3 miles from house its having a big back yard private parking and time is not wasted on travelling to park because its just 3 miles from Hershey Attractions. Wildwoods Inn Hershey park is the very first vacation rental in this area. Wildwoods Inn Hershey Road is right on Hershey park Road all Hershey attractions are just 3 miles from house its having a big back yard private parking and time is not wasted on travelling to park because its just 3 miles from Hershey Attractions. Wildwoods Inn Hershey park is very first vacation rental in this area . toilet, Toilet and Wash basin. PRIVATE DRIVE WAY FO9R AROUND 6 CARS PARKING . Books for all ages . For children's fairy tales books. Table Hockey , Foosball table . At Hershey there is a public pool at very reasonable rates. Just 3 miles from house . A group of friends from college (all in our mid 30s now) wanted to get together for a weekend and spent it here. It was great because we all essentially had our own rooms at night and it had everything we needed while staying at the house. We enjoyed our time here and would recommend to a group that plans on staying in the area. We were 6 girlfriends visiting the area for wineries and breweries and stayed at Wildwoods Inn for property's location - close to all the breweries and wineries in the area. We also visited Chocolate World while our way to Troegs Brewery which was just 3 miles away. The house is very Clean and Spacious. Highly recommend. We asked us the owner on recommendation of breweries and he texted us a long list. We are glad we visited breweries from his list. Some of them had very unique beers. Loved our stay at Wildwoods. Our was a family vacation to Hershey Park with brother and his family. This was a perfect location barely 2 miles away from the attractions. Loved their patio. Adults did not go the Park on the 3rd day. Instead we spent quite time on the patio after dropping kids to the Park. Best time spending time with brother and his wife. Will definitely visit again. Highly recommend. Friendly and courteous property owner. Answered all our questions. Everything we wanted and more! It was pleasure serving to you and your friends . Please do give us opportunity for your future visits to Hershey , PA . It was pleasure serving to you and your family . Please do give us opportunity for your future visits to Hershey , PA .
House was Amazing it's very spacious Location was great it's right on Hershey Attractions road all Hershey attractions were just 2 minutes drive and straight from house driveway. We were surprised the rates were so reasonable for full house awesome location with beautiful backyard and deck was Amazing. House was clean and beds were very comfortable. Sunroom was very comfortable for children's and foosball game children's had great time . Already recommended to family and friends. Will definitely stay again . Thank you for your wonderful review. It was pleasure to serve you'll. Thank you for giving us opportunity to serve you and your family. Please do give us opportunity to serve you and your family for your future trips to Hershey. Wildwoods Inn is right on Hershey Road Hershey attractions are less then 3 miles from house.Amish county (Lancaster) 20 minutes drive from house.Ski roundtop just 25 minutes drive. Pets stay free of charge. For policies please visit www.visitwildwoodsinn.com Max occupancy 11 person . REFUNDABLE DAMAGE SECURITY DEPOSIT OF $250 WILL BE CHARGED TO FINAL TOTAL AMOUNT.